This particular car sports an all aluminum 434 cubic inch small block engine with a Fuel Injected Intercooled Twin- Turbo system built by Nelson Racing. It’s backed up by a G-Force road-race 5 speed transmission, McCloud dual disc clutch and a Winters quickchange rear end. The Chassis is a complete cage with a roll bar that is completely hidden with a section running down the center of the Split rear window. The independent rear suspension was fabricated in house by the Coddington Crew, and the front suspension has Bilstein coilovers with Wilwood disc brakes on all four corners. 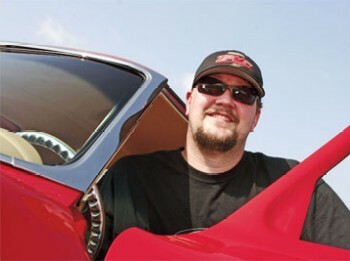 To make sure this 1,500 Horse Powered Beast was built with creature comforts, such as Air-Condition and Power windows; Shaun made supervised visits during the build. 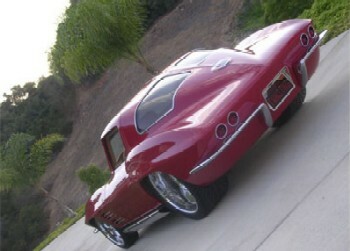 There are lots of great features about this CORVETTE that sets it apart from others; such as the leather/Suede interior by Gabe Lopez (Leather Floors) the one piece side windows (No Side Vents) the 4 inch Side Pipes and One – Off Grill by Scott Parker, and the one of a kind aluminum hood, built by the late Master metal Fabricator, Roy Schmidt. From the Pen of Larry Shinoda to the hands of Boyd Coddington, this 1963 StingRay is a rolling work of art.